Set your rack pull height based on your personal lockout sticking point. If your sticking point is below the knee, then set the height just below the knee. If you sticking point is above the knee, then set the rack height in-line with the tear drop quad muscle. Coach’s Tip: When progressing with the rack pull, increase the weight and not the physical rack height. Take a grip that’s similar to what you perform with your normal deadlift training and in competition. Set the back, pull the bar close to the body with the lats, and think about the hands being hooks. Take a deep breath and grip the floor, then drive the feet through the floor. Coach’s Tip: Spend a lot of energy focusing on the hip extension at the top, as this movement is designed to supramaximally load the hips for carryover to your normal deadlift. After you’ve set the back and hit a strong hip extension, keep the lats contracted and hold the weight for a second at the top. This is essential for improving grip strength and creating a neural adaptation in the body when working with supramaximal loads. Coach’s Tip: When applicable, try to hold the weight for a slightly longer period at the top for increased grip strength carryover. What Is a Rack Pull Deadlift? The rack pull is a deadlift variation that is typically done within a power rack (but can also be off blocks, which is often referred to as a block pull). Both movements limit the range of motion (bottom of the pill), which can be done to isolate a specific sticking point in one’s, pull, improve positional awareness at a specific segment of the pull, and to enhance muscle development of various muscle groups (slightly different than the conventional deadlift). Below is a demonstration of the rack pull. Below are the primary muscle groups worked during the rack pull. The rack pull targets the glutes (hips) to a high degree due to both the limited range of motion in the deadlift and the high amounts of loading that can be used. By limiting the range of motion, you minimize the amount of lower back and hamstring involvement and focus more on the gluteals to provide enough force for hip extension. The hamstrings, while not fully loading in the movement, are still involved and can be trained depending on the depth at which the rack pull is from. Generally speaking, the lower the starting height, the more hamstring extension and flexion must occur, meaning great hamstring involvement in the completion of the lift. The quadriceps are slightly engaged and used to finish the lift off via knee extension. While the amount of knee flexion is limited in this movement, rack pulls from lower depths can call on the quadriceps to a small extent, especially if the hips are kept low during the pull. Similar to the sumo deadlift and trap bar deadlift, the decreased range of motion result in less hip flexion needed in the pull. In doing so, you can decrease the amount of lower back stress and the demands placed upon the spinal erector muscles. The trapezius and upper back muscles work to maintain proper back tension. The ability to load the rack pull with very heavy weight can also help to overload the upper back and trapezius muscles and stimulate new muscle growth. Below are four (4) benefits of programming rack pulls within training programs. The rack pull is a pulling variation that can be interchanged with the sumo, conventional and trap bar deadlift in times where a lifter is looking to increase pulling strength, grip strength, muscle development, and neurological adaptation to heavy loads. In a deadlifting program, the rack pull can be used to isolate muscle groups such as the glutes, trapezius and back, and grip OR to help limit lower back stress yet still allow for pulling it occur. The partial range of motion (top half of a deadlift) of the rack pull targets the trapezius and back muscles to a great extend due to (1) the lifter lifting heavier loads than normal, and (2) not being as bent over where they could potentially used more of their quads, hamstrings, and glutes to assist more in the lift. This can be key for lifters who lack size, strength, or are looking for the aesthetic appeal of larger, fuller traps. They rack pull can be a great exercise to increase grip strength due to the lifters natural ability to lift more weights from this partial range of motion lift. Increasing a lifter’s grip strength can enhance neurological engagement and readiness for heavy lifts and help them keep their back locked during deadlifts. Who Should Do Rack Pulls? The below section breaks down the benefits of the rack pull based on an lifter’s/athlete’s sport goals and abilities. Rack pulls can be used to increase overall pulling strength, develop stronger trapezius and back muscles, strengthen the posterior chain, and enhance grip strength. In addition, the rack pull can be used to increase lock out strength for lifters who have issues above the knee. Lastly, the rack pull can be programmed to maintain pulling volumes during periods where lower back stress management and/or recovery is key. Rack pulls, in Olympic weightlifting, are often called block pulls, which is essentially the same thing. Lifters will perform block pulls from various heights to increase strength and speed at specific segments of their pulls. This can be helpful for lifters who lack explosive strength in the second pull, have positional issues off the floor, or simply are looking to strengthen pulls without overtaking the lower back. The rack pull can be used for many of the same purposes above, however functional fitness athletes can also get some of the similar benefits of rack pulls from performing heavy farmers carries or Yoke Walks. 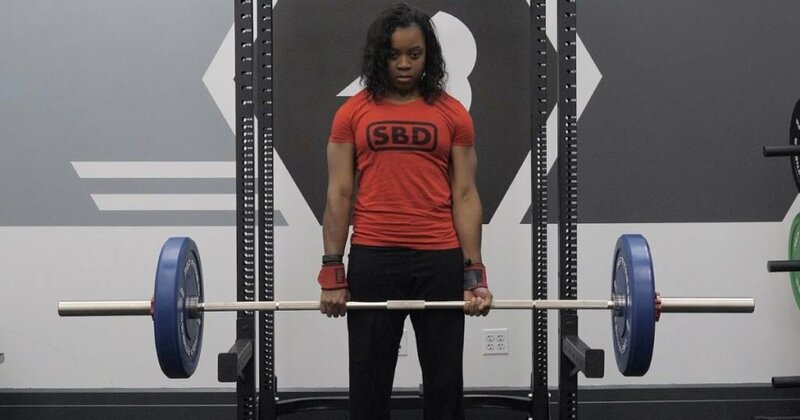 For most formal sports athletes, rack pulls may sometimes be used to increase overall strength and muscle mass, however most athletes will benefit from performing the fullest range of motion movement, such as the conventional, sumo, or trap bar deadlift. This can however, be used if coaches are trying to limit lower back loading on the athlete yet still increase loading. Rack pulls can be used to increase muscle hypertrophy, basic pulling strength, and as a teaching progression for the deadlift. Lifters who are looking to increase upper back strength, glute development, and/or improve range of motion and patterning specific to the conventional and/or sumo deadlift can use rack pull for such purposes. Below are four sets, reps, and weight (intensity) recommendations for coaches and athletes to properly program the rack pull specific to the training goal. Note, that the below guidelines are simply here to offer coach and athletes loose recommendations for programming. 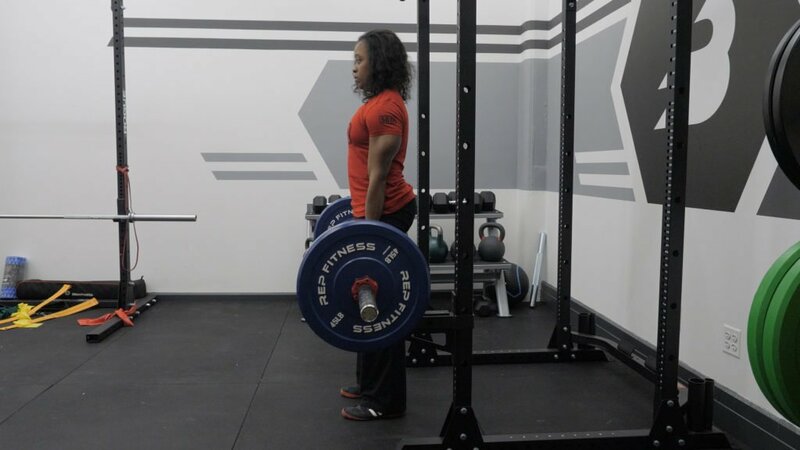 The rack pull can be used to develop a lifter’s basic understanding of a deadlifting movement, and can be progressed to lower pulling heights until the barbell is resting on the floor. This should be done with a light to moderate load for moderate repetitions in a controlled fashion to instill proper control and coordination. Training the rack pull for muscle hypertrophy should include a moderate to high amount of volume with a moderate to high amount of loading. The below rep ranges can be used as general guidelines to increase muscle hypertrophy of the glutes, trapezius muscles, and upper back. Rack pulls can be programmed very similarly to most deadlift variations, and can develop serious lockout strength, trap development, and enhance neurological abilities of a lifter. The below ranges can be used to increase pulling strength. While the rack pull may not necessarily be a lift that is trained for muscle endurance, some lifters may want to train more repetitions to increase training volume, muscle hypertrophy, and/or to increase carrying capacity for strongman events. The below rep ranges can work best for this type of goal. Below are four (4) rack pull variations that can be used by coaches and athletes to keep training varied and progressive. Reverse band rack pulls are done to overload the rack pull and allow a lifter to increase confidence, grip strength, and neural firing patterning. In this set up, the resistance bands are stretch maximall at the beginning of the lift (fixed to an overhead support) to assist the lifter in getting the load moving upwards. As the lifter gains more acceleration in the pull, the bands decrease the amount of assistance to force the lifter to increase their rate of force production at the top half of a the pull. Like other deadlift movements, the rack pull can be paired with chains and or against resistance bands. Accommodating resistance will increase the force production needed throughout the entire lift, so that a lifter gain gain strength off the rack and throughout the entire range of motion. This is key to increase motor unit recruitment, muscle firing rates, and increase sticking point strength. The fat bar, or axle bar rack pull is done identically to the rack pull above however with a barbell or grips that increase the thickness (diameter) of the barbell. By doing this you challenging grip strength in the pull. The isometric rack pull, also known as the pin pull, can be done inside a power rack in which the lifter sets the barbell BELOW a pair of pins or safety stoppers (typically placed under a lifter when squatting, benching, etc. In doing so, the athlete can maximally pull the barbell as hard as they can upwards, however the rack itself will not allow the lifter to actually create dynamic movement. Isometric contractions will occur, which can be helpful to increase strength at a specific sticking point, help a lifter learn how to “grind”, and even enhance motor recruitment and muscle firing patterns at specific points in the pull. Below are three (3) rack pull alternatives coaches and athletes can use to increase overall pulling strength, address weaknesses, and build muscle. 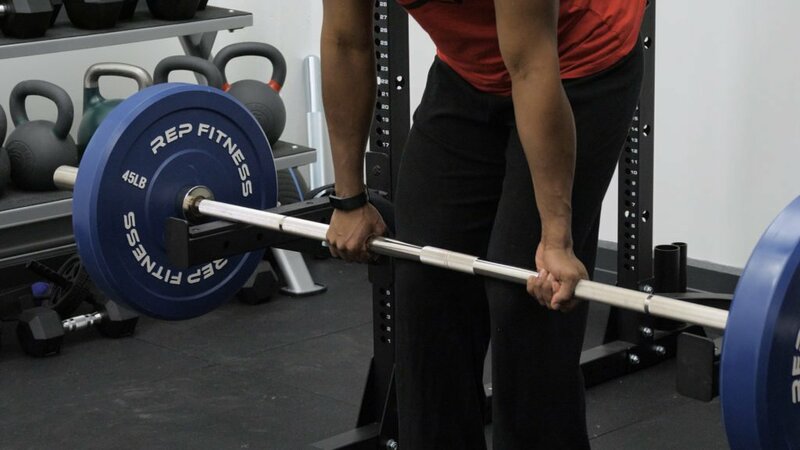 The trap bar deadlift is a rack pull alternative due to the limited range of motion (relative to the conventional deadlift) and its dependency on lock out strength.both movements can also be used to supra-maximally load a lifter to increase neurological development and muscle recruitment. Th sumo deadlift is similar for a rack pull in that the lifter has a short range of motion to deadlift with than the conventional deadlift. In both the sumo deadlift and the rack pull, the trapezius and upper back muscles are stressed to a great degree as well. Lastly, both the sumo deadlift and the rack pull can be used with lifters who may have movement and/or strength limitations are the bottom of the deadlift (deeper ranges of motion). Deadlifting from an elevated starting point by default is a “rack pull”, however some lifters may refer to this as a low block deadlift or pull. In general, the training stimulus of a deadlift from the blocks and a rack pull are similar; allowing coaches and athletes to target a specific range of motion and/or address strength sticking points.